My name is Choco and itï¿½s pretty obvious why. I came to M'Shoogy's after being shot. I am completely healed and get around without any problems. I do have a funny little hop now and then. That just makes me all the more lovable. I am a very friendly guy that loves to be with people and gets along well with other dogs. I am a real couch potato, which explains the extra weight I've put on. The other thing you need to know about me is that Iï¿½ve been diagnosed with Cushingï¿½s Disease which is chronic and requires medication for the rest of my life. If you are looking for a lovable happy adult companion to sit and watch television with or to just snuggle and hang out with, I'm up for the job. Come see for yourself. I'll have a smile on my face with my tail a wagging. 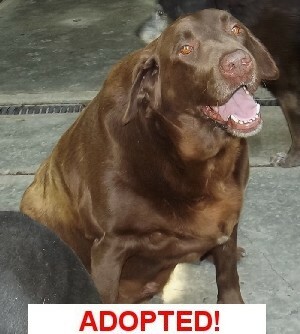 Those adopting Choco can get his medication from Angelï¿½s Vet at our cost.